Made with a soft fluffy egg sponge, dipped in Kytons decadent chocolate sauce and rolled in coconut these have twice been awarded the best lamingtons in Australia. Kytons traditional lamingtons is its signature product and winner of multiple awards including twice having been awarded first prize at the National Baking Awards. Made with a soft fluffy egg sponge, dipped in Kytons decadent chocolate sauce and rolled in coconut these are decadent and delcious. 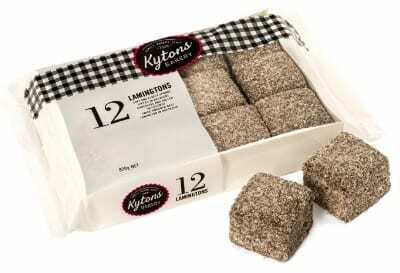 The 12-pack of lamingtons is available exclusively through Kytons fundraising drives or direct from Kytons retail store.